Full Name: Leslie Steven Sawyer. Aussie Les was a Dan McCormick recruit to National League sister track Oxford in 1978. He began riding at Claremont Speedway in Perth at the end of 1976 and by 1977 he reached the Australian Championship. In the same season he was runner-up in the Northern Australian Championship. 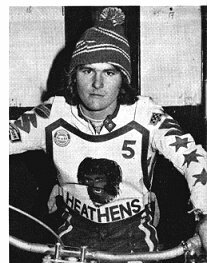 He was reportedly discovered by Bernie Persson, riding at Perth, and recommended to the Heathens as a possible signing during thw Winter of 77/78. His relatively short British League career began at Oxford with three matches at the beginning of the season before he picked up an injury and lost his team place. He stuck around though and not only forced his way back into the Cheetahs side but also straight into the Heathens British League team. In truth, it was probably a little too early for the youngster. In 12 matches for Oxford, he notched an average of 3.26, so the step up to the higher division proved out of his reach. Four appearances in 1978 - scoring six points in total - were followed by a solitary turn-out in the Dudley-Wolves Trophy of 1979, before Sawyer bowed out of the Cradley ranks.